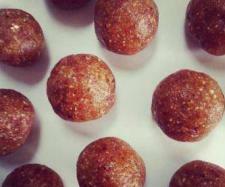 Try these healthy yummy treats, Caramel popcorn bliss balls. I made this in the thermomix but you could easily do it in a good food processor. Add walnuts and macadamias to the bowl and process 10 sec/sp 7. Scrape down sides of bowl and repeat. Add dates, puffed corn, vanilla and salt and process 10 sec/sp 7. Scrape down sides of bowl. Add water to bind mixture and process 10 sec/sp 7.